Light is essential for plants to survive, but the color of that light can have a significant impact on how they develop. With the help of LED grow light technology, multiple experiments have been conducted to determine how plants react to light when exposed to different colors of the spectrum in terms of height, weight, color, texture and more. Additionally, colored shade cloths can have the same effect on plants, and colored films are being used on the growing areas of the International Space Station as well! Ultraviolet: Prolonged exposure to UV light can be harmful to plants, just as it is to humans. A study confirmed that when UV light exposure is eliminated, plants experience enhanced growth. Violet: Violet light exposure has been found to intensify the color, aroma and taste of plants. It also improves the antioxidant functions of plants, which naturally helps prevent cell damage. Blue: The most influential of all hues, blue light has the most powerful effect on plants. It encourages plants to accept more energy, reduces their water loss, and increases their growth and maturity rates. At least a minimal intensity of blue light is needed indoors for normal plant growth. In general, plants grown under blue light are shorter and have darker, thicker and greener leaves than those not exposed to blue light. These attributes may be desirable when growing ornamentals, for example. Green: Not surprising, since most plants are green, this color has the least effect on a plant’s growth. Green light does, however, enhance the production of chlorophyll and gives plants a greener color. Yet, some research indicates green light can have positive effects on growth and flowering. That is impacted by the intensity of the green light, whether any other colors and intensities are present and the type of crop. Yellow: Because yellow isn’t far off from green in terms of wavelength, it also doesn’t have much effect on plants. It has no influence on photosynthesis and, as a result, growth is reduced. Red: By itself, red light can help plants yield more leaves than blue light alone. But together, the combination of red and blue significantly improves plant growth, making it an optimal choice for development. Far Red: Like red light, far red light plays an important role in plant development. Specifically, far red light affects germination and flowering. Essentially, this light encourages flowering because plants require less time in darkness. Green light does play an important role in gardening, particularly as it relates to people. Without the presence of green light, plants do not appear green to the naked eye. Not only is green light needed to reduce eye strain for employees, but also it helps more easily detect any problems or pest issues. The good news is that white LEDs combine green, red and blue light, which provides the benefits of all three colors. Questions about light in your greenhouse or other growing settings? Let us know! When you call Gothic Arch Greenhouses at 800-531-4769, you’ll always get a friendly representative ready to help you. You can also visit our website at www.GothicArchGreenhouses.com for more information as well. 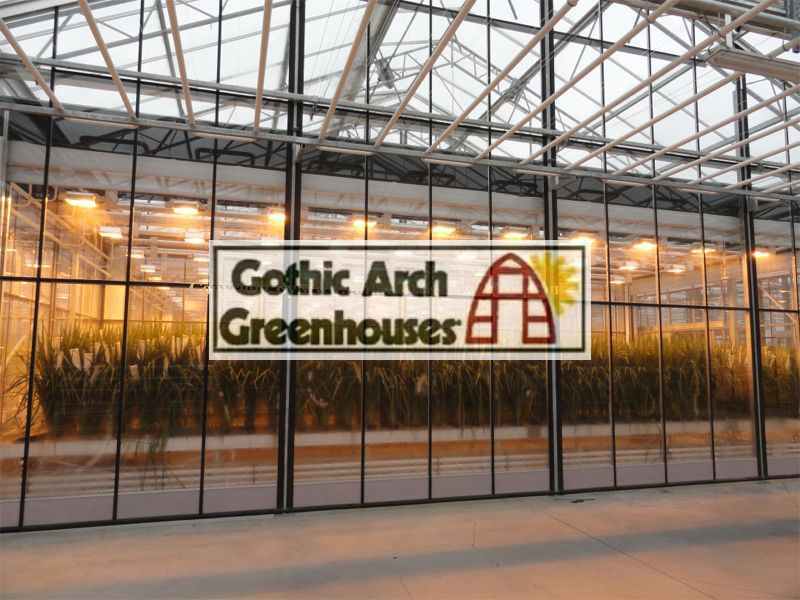 This entry was posted in Greenhouse Supplies and tagged benefits of lighting, gothic arch greenhouses, greenhouse lighting, how light color affects plant growth, LED greenhouse lighting on April 18, 2019 by admin. Managing the environment in your greenhouse is crucial, but just as important is keeping pests out of it. The warm, humid conditions of a greenhouse help extend growing seasons or create an ideal setting for plants to thrive. Unfortunately, those same conditions make for the perfect breeding ground for pests. Because they can flourish without the presence of their natural predators inside the greenhouse, pests can inflict severe damage very quickly if not detected and controlled early on. Fortunately, before it gets to that stage, there are many things you can do to minimize the threat of pests in your greenhouse. Prevention is the best way to control pests in your greenhouse, so keep these helpful tips in mind. Thoroughly inspect new plants introduced in the greenhouse. This is the most common way pests get in your controlled space, and if they go undetected, they have the potential to create devastating damage. Check and secure all greenhouse openings. That means doors, screens and vents. Repair any holes or tears, replace seals, etc. Proper maintenance now can prevent bigger problems later. Always use clean equipment and materials. Everything in the greenhouse must be free from the threat of pests. Make sure potting material, containers, tools and other equipment are clean or sterile. Prevent pools of standing water. The resulting algae and moss growth can lead to development of pests. Avoid overwatering, ensure proper drainage and good ventilation in your greenhouse. Keep the greenhouse area clean. Remove all trash and plant debris regularly, and give your greenhouse a thorough cleaning after each production cycle. Also mow the area around the outside of the greenhouse to control weeds. Taking these steps can set you up for growing success in your greenhouse, and we are your source for all the supplies you need. Please call us at 800 -531-4769 or visit www.GothicArchGreenhouses.com, and we’ll be happy to help! This entry was posted in Greenhouse Information and tagged gothic arch greenhouses, greenhouse pests, how to prevent greenhouse pests, managing pests in your greenhouse, mobile al on February 26, 2019 by admin. Gardeners can be some of the best do-it-yourselfers around, so they of all people would appreciate a considerate DIY project—or gift—during this time of year! If you’re not crafty, creating a DIY gift can seem pretty intimidating, but we’ve put together a list of what we think are the best do-it-yourself gifts for gardeners out there. The best part? They span all crafting abilities so anyone can give their favorite gardener a thoughtful gift this year. Antique Spoon Plant Markers: Any gardener could use a little signage in his or her garden, putting plant markers at the top of our recommendations. Using antique spoons—whether culled from your extra stuff or a secondhand store—can add a vintage flair to any garden. Stamp them or paint them with plant names; you can even create a collection! Decorative Watering Cans: Functional and fun, personalized watering cans can add a bright spot to an otherwise everyday gardening accessory. Make your selection from dollar stores or thrift stores, if you like. Create or use a stencil if you don’t consider yourself much of a painter, and paint your design. Your gardener can use your gift to water plants or even as a planter. Gardeners Gift Basket: If crafting isn’t your thing, you can still put together a thoughtful and useful gift by collecting gardening essentials and presenting them in a unique gift basket. Find a pot (you can go the inexpensive route and paint it), then fill it with small tools, gloves, seed packets and more! The bonus is that you can truly personalize it to your recipient. Seed Tape: What’s a great do-it-yourself gift for a gardener to DIY? Seed tape! Again, if you know your gardener well, you can use the seeds of plants you know he or she will love. Especially if you have a budding gardener on your shopping list, seed tape is a great way for them to get started because it’s so easy to plant and get practice nurturing the sprouts. Fresh Garden Gift Tags: Is your gardener one to share his or her bounty? If so, you can help them customize their gift with these Fresh From The Garden gift tags. Ideal for the person who preserves their harvest by canning or making jams, these homemade gift tags make a great gift for gardeners who use the fruits of their labor to keep on giving. Gardener’s Soap: Gardeners are known to get their hands dirty, so it helps to have an extra bar of soap around. But you can make it extra special by making it yourself! This orange and clove recipe makes several bars that you can give to one lucky recipient or split it up among several gardeners on your list. Ideal for cleaning dirt of your hands and keeping them moisturized too! Garden Glove Rack: If you’ve got some time but maybe not much of a budget, transform leftover plywood and metal clips into an upcycled garden glove rack. It’s a great way for gardeners to keep track of their gloves, plus you can paint it and customize it. This one will take a couple of hours to complete based on how detailed you might get with the painting. Gothic Arch Greenhouse: Get your gardener what he or she really wants—a greenhouse! So maybe it’s not a traditional DIY gift project, but for your favorite grower, it just supports their own DIY efforts in their garden. Just in time for the holidays, our signature greenhouse is on sale, so you can get a great deal on a great gift! If you’ve got a greenhouse or greenhouse supplies on your shopping list this year, let us know! Our friendly representatives are happy to help you. Call us at 1-800-531-4769 or visit www.GothicArchGreenhouses.com. This entry was posted in Greenhouse Information and tagged best diy gifts for gardeners, diy gift guide, diy gifts, diy gifts for gardeners, gothic arch greenhouses, gothic arch greenhouses diy gift guide on December 9, 2018 by admin.